If we can refer to Kingsway as the Banh Mi Highway or "AutoBanh", then North Road should be considered Jap Chaeway (that is a really bad pun I know...). 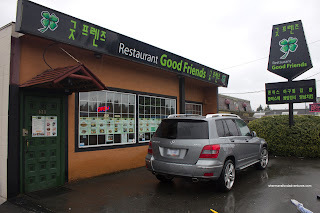 With so many choices for Korean food along the Burnaby-Coquitlam border (Burquitlam to be exact), Rich Guy, Rich Gal and I met up for lunch at Good Friends. For some reason or another, that was the first thing that came to mind. Was it the cool green signage in front? Or was it the non-Korean sounding name? I really am not sure. Sometimes, my choices are made irrationally where my fellow eating companions pay the price (both money-wise and food hazards). Whatever the case, we committed to it and there was no going back, even though construction in front made me enter through the back to get to the parking lot (which was an adventure, not sure if I would've not hit anything if it were dark). Obviously, the previous restaurant that occupied the building was not Korean because the layout and seating was a bit strange. Moreover, it didn't help the already sparse service because each side of the restaurant was hidden from the staff. Don't get me wrong, the service was friendly, it was just not readily available when we needed it. 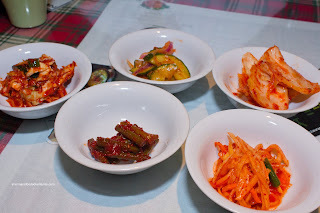 When we finally got our order in, the Banchan arrived. This had to be one of the most one-dimensional array of banchan we've ever had. Each and every one of them were very similar in terms of appearance and taste. Sprouts or stewed potatoes, where did you go??? To be fair, we did get some stewed potatoes a little later (possibly they were not ready yet as they were pretty underdone). 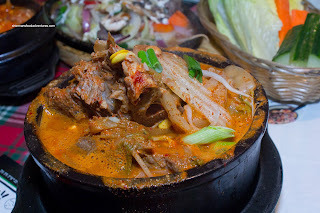 For our mains, we had the Pork Bone Soup first arriving bubbling hot. Within the broth lay 2 massive pork bones with tender meat. The broth was only moderately spicy and was actually not bad. It exhibited a bone marrow creaminess which gave it body and depth. Normally, we'd get the dolset bibimbap, but we couldn't resist their lunch special. The regular Bibimbap was only $6.00 and when it arrived, the darn thing was huge. A very good value indeed. As you can clearly see, there was no absence of ingredients presented to us in what was the size of a medium mixing bowl. The rice was a touch wet (but that is our fault for not getting the dolset) while the ingredients were all the right textures. 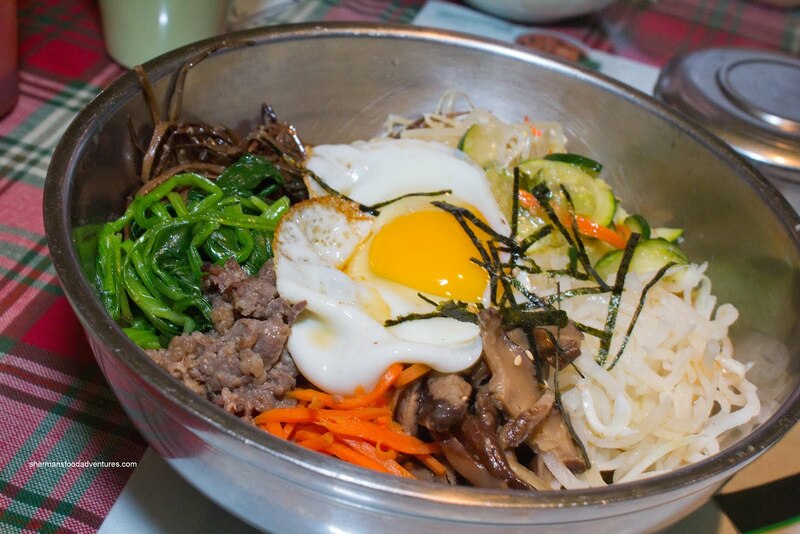 Not the best bibimbap we've ever had, except it was one of the cheapest. When the Bulgogi was presented at our table, we were confused. What was with this wet mess on a cold hot plate? An oxymoron? No, it really was the bulgogi. Lacking in meat and in flavour, this was a fail. We couldn't figure out how to wrap it in the thin pieces of romaine hearts either. Huh? Yah, that pretty much sums up our experience here. It was "alright". I think if the prices weren't as reasonable, it would be a different story. With all the other choices for Korean food in the area, this would not be my first choice. I've always seen this place, but wasn't sure about it. Now I won't bother, haha. I rather like Korean food, but I find it to be a bit on the pricey side(same with Thai food--why so expensive?). I especially like all the side dishes! +1 on MBS' comments, I find Korean resto prices tend to be on the high side, relative to Chinese and Japanese. 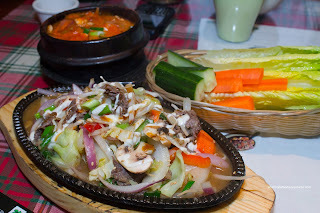 I love Korean foods but rarely, almost never, eat out at them for said reason. @darKNiGht I'm not questioning the authenticity nor was it bad. It was just all the same. We just wanted some variety. Also, it's hard to compare food locally vs Korea don't you think?